Dawn quoted the Jane’s Defence Weekly that Pakistan wants new 16C/D Block 52 multi-role fighters, which are equipped with precision strike capability, as it would enhance its capability to reduce collateral damage in the war against terrorists who often hide among civilians. Pakistan is trying to get more F-16s from the US as well as looking towards countries like Russia and France for new aircraft to replace old ones to match India’s defence purchases, according to a report. Jane’s Defence Weekly reported this week that Pakistan would seek to purchase ten F-16 additional planes from the United States if the current deal for eight of these fighter jets is successfully concluded. 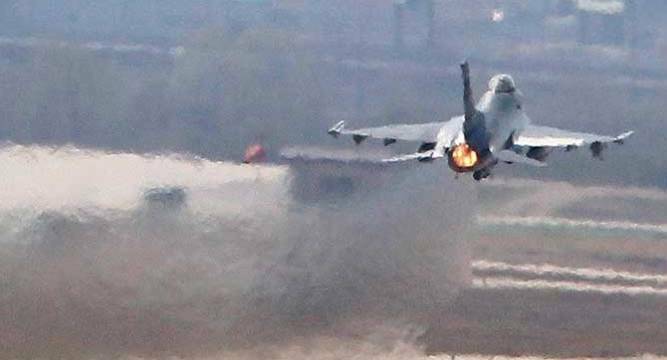 A “decision in principle has been made to buy 10 more F-16s,” a senior Pakistani government official told Jane’s, while adding that “the exact timing to place an order is yet to be decided”. He said Pakistan Air Force needed to retire 190 planes by 2020, forcing the country to look for various options. The official said that the strong resistance it faced in the US Congress for buying a small batch of eight planes was “discouraging”. The official noted that while French planes were “very expensive, the Russians are not and they are equally good”. Last week, the US Senate rejected a move to shoot down the proposed sale of eight F-16, which is now in its final stages. On Saturday, the 30-day mandatory period, that allows Congress to block an arms sale to a foreign country, also passed. Although some technical details are still being worked out, the deal for these eight aircraft is almost final, the report said. In September last year, Russia offered to sell Su-35 planes to Pakistan, which are among the fifth generation aircraft, it said. Pakistani officials say that India’s defence purchases also influence their search for a matching technology. India is already working on a plan to replace its current fleet of planes with fifth generation aircraft by 2020, forcing Pakistan to do the same. They say that while Pakistan is not looking to match the exact number of planes the Indians have but they would like to maintain a fleet of 350 to 400 aircraft. Pakistani officials point out that they also have a large-scale defence collaboration with China, “which is a great source of strength” for the country. The eight planes that Pakistan is buying from the United States include two single-seat F-16Cs and six twin-seat F-16Ds, along with associated equipment - for about USD 699 million.